The Civilian Complaint Review Board, a key provider of oversight of police conduct in New York City will be subject to oversight itself at a Friday hearing of the City Council’s Committee on Public Safety. It will be the first of its kind during the current administration wherein the CCRB is evaluated by the Council outside of the annual budget process. The hearing comes amid controversy over NYPD transparency with regard to officer discipline records, alongside the perpetual scrutiny of policing in the city, and three months after Mayor Bill de Blasio named a new CCRB chair, Maya Wiley, who is expected to testify. The CCRB is an independent agency of civilians, as the name suggests, tasked with investigating complaints against police officers and recommending disciplinary action to the commissioner of the police department. It’s composed of 13 members - one each from the five boroughs, chosen by the City Council; five members, including the chair, chosen by the mayor; and three members selected by the police commissioner. Each member serves a three-year term and can be reappointed to the position. 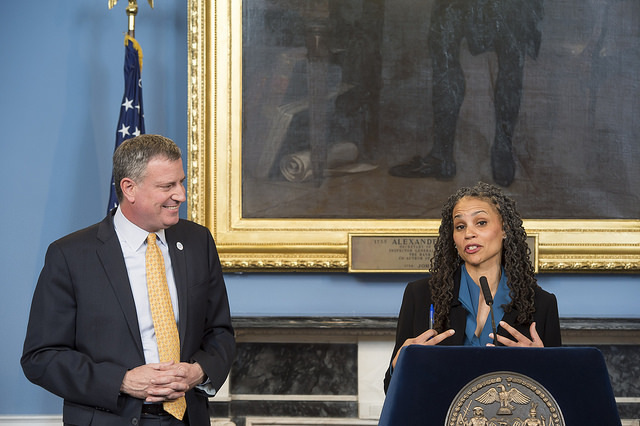 Wiley, the current chair, was recently appointed after leaving her post as counsel to de Blasio in July. Her appointment was met with skepticism from certain quarters, with Patrolmen’s Benevolent Association President Patrick Lynch calling it a “politically-motivated” tactic used by the administration that undercut the agency’s independence. Wiley’s predecessor, Richard Emery, who resigned amid scandal, was also seen by some as a political appointment and criticized for his close relationship with former police commissioner Bill Bratton. De Blasio has had a contentious relationship with Lynch and the PBA, which is locked in negotiations with the city as one of a small number of municipal unions not under contract. Still, de Blasio and Bratton instituted new training protocols for police officers and while crime has continued to decline, so have arrests and complaints to the CCRB. Friday’s hearing will examine the current CCRB’s overall functioning, looking at its case processing times, procedures that have been put in place under the current administration and outreach efforts made by the board to communities on the ground. Undoubtedly, it will touch upon larger issues as well, coming at a time when the administration is besieged by criticism over its refusal to disclose police officer disciplinary records and within the same week that an officer shot and killed an elderly, mentally ill Bronx woman in her home. Besides the usual questions about procedures and agency efficiency, Gibson said, “We also wanted to look at the future of the CCRB. It’s critical that, as CCRB continues to grow...I want to find out how the relationship with the police department is going to be.” Looking ahead to next year’s budget season, Gibson said the hearing would also help the Council determine how to help the CCRB to more effectively do its job. CCRB Chair Wiley said she looks forward to being able to show the committee the improvements and impact the agency has made in handling cases and in building community relationships. “We’re in a situation where we’re consolidating the improvements made in the past two years,” she said in a phone interview with Gotham Gazette. Just last month, the agency released a new website and made data on police misconduct allegations easier to access and understand as part of a larger Data Transparency Initiative. The CCRB compiles four main categories of data - complaints, allegations, victims, and alleged victims - and demographic data on NYPD personnel, and issues monthly, annual, and semi-annual statistical reports. It also examines issues of police misconduct and releases reports with recommendations for improving policies and procedures. Wiley said she is also looking for ways to increase discussions about policing in communities and awareness among people about CCRB’s role. “It’s certainly an area of growth opportunity for the agency,” she said. But she won’t be surprised if she’s asked about the controversy over section 50-A of the Civil Rights Law. That provision has given the mayor and the NYPD legal justification, they say, to shield from disclosure the personnel records, including disciplinary proceedings of the CCRB, of Officer Daniel Pantaleo, whose use of a chokehold led to the death of Staten Island resident Eric Garner. During a time where several entities were seeking Pantaleo’s CCRB record, the NYPD stopped publicly posting promotions and disciplinary actions at One Police Plaza after decades of doing so. Last Friday, the mayor proposed changes to the law that would allow for more transparency and disclosure of officer disciplinary records. Even though the de Blasio administration is appealing a court ruling that said the city could release Pantaleo’s record, de Blasio has said he favors disclosure. Communities United for Police Reform, a coalition of advocates, said the mayor’s proposal was a red herring that doesn’t in fact create substantive reform. A number of groups and experts have said that the city could continue to post NYPD personnel records and have questioned the city’s appeal. Josmar Trujillo, an organizer with the Coalition to End Broken Windows, a police reform organization, said it would be interesting to see the Council do “oversight of an oversight agency,” but he questioned whether it would be substantial. “From my experience, the CCRB kinda just limps along and tweaks a few things, and the City Council isn’t really involved,” he said. He criticized the CCRB as an “ornamental agency” that has limited capacity to hold police officers accountable, a critique that has been echoed by other advocates of police reform in the past. Earlier this year, government reform group Citizens Union proposed solutions to that issue, calling for structurally and legally empowering the CCRB as part of a larger position on police accountability. Citizens Union also wants more public information from the police commissioner when he or she disagrees with a CCRB recommendation for officer discipline. Although reform may not be on the committee’s stated agenda for Friday, Trujillo hopes the Council will show how they can act as an outside check on the relationship between the mayor and the CCRB, and look at how the new chair of the board is handling her role.